Mitaban Dip is used in dogs for the treatment of generalized demodicosis (mange), a skin disease caused by a small mite not visible to the naked eye. How it works: Mitaban Dip contains Amitraz, an antiparasitic drug which kills mites. Dosage and Administration: Use this medication exactly as directed by your veterinarian. If you do not understand the directions ask the pharmacist or veterinarian to explain them to you. Prior to the first treatment, clip medium or long-haired dogs. Bathe the dog with mild soap and water then towel dry the pet. To treat the dog, prepare the treatment by mixing the contents of one 10.6ml bottle of Mitaban Dip Liquid Concentrate with two gallons of warm water. For large dogs it may be necessary to mix two bottles of Mitaban Dip with four gallons of water. Thoroughly wet the entire dog with a freshly prepared treatment. Do not rinse or towel dry. Allow the pet to air dry. Do not get any treatment into the pets¿ eyes. Do not use the water mixture on more than one dog. Three to six topical treatments (14 days apart) are recommended for the treatment of generalized demodicosis. Store undiluted Mitaban Liquid Concentrate Dip at room temperature away from moisture and heat. Keep this medication away from children and pets. 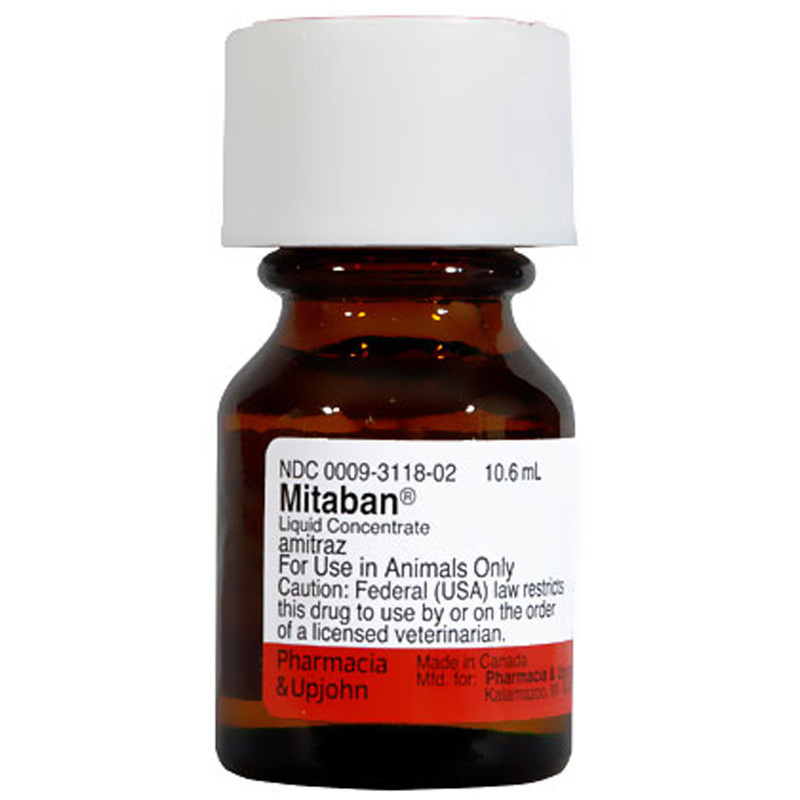 Mitaban Dip is a prescription medication used on dogs for the generalized treatment of demodectic mange. Do not use on cats. Mitaban Dip is a monoamine oxidase inhibitor (MAOi). Tell your veterinarian about any other medications you are giving your pet, including the use of Preventic Collar. Humans taking a MAOi such as Nardil, Parnate, or Selegiline, or who are diabetic should not administer this medication. Mitaban Dip must be diluted with warm water before using. Tip: Use rubber gloves when mixing Mitaban Dip with water and when treating the pet. Storage: Store at room temperature, away from moisture and heat. Other Ingredients: Xylol, propylene oxide, and a blend of alky benzene sulfonates and exthoxylated polyethers. What happens if I miss giving a dose: Apply the next dose as soon as you remember. Do not apply a double dose. What happens if I overdose the pet: Seek emergency veterinary medical treatment. Symptoms of Mitaban Dip overdose include incoordination, depression, high blood sugar levels, slow heart rate, decreased body temperature or death. Possible side effects of Mitaban Dip: If any of the following serious side effects occur, stop giving Mitaban Dip and seek emergency veterinary medical attention; an allergic reaction (difficulty breathing; swelling of the lips, tongue or face; hives), a severe headache, restlessness, agitation, or irritability, sweating, convulsions, uncontrollable or irregular movements. Other less serious side effects may occur. Continue giving Mitaban Dip and talk to your veterinarian if your pet develops dizziness or drowsiness, nausea, abdominal pain or diarrhea, insomnia, mild confusion, agitation or anxiety, dry mouth. Other side effects may also occur. Talk to your veterinarian about any side effect that seems unusual or bothersome to the animal. What should I avoid while giving Mitaban Dip: Mitaban Dip may cause short term sleepiness in treated animals. Treated animals should not be subjected to stress for a period of at least 24 hours after treatment. Keep the dog dry between treatments. Do not use Mitaban Dip on pets using another MAOI. Do not use on pets that are diabetic. Do not use on dogs less than 4 months of age. Humans should wear rubber gloves when mixing and apply Mitaban Dip. Humans taking MAOI¿s or who are diabetic should not administer this medication. What other medications will affect Mitaban Dip: Before giving Mitaban Dip tell your veterinarian if your pet is also taking fluoxetine or meperidine or if your pet is using Preventic Collar. Talk to your veterinarian or pharmacist before giving any prescription or over the counter medicines. Cautions: Avoid handling pets immediately after treatment. Mitaban Dip is also a monoamine oxidase inhibitor (MAOI). Humans taking MAOIs need to be cautious when handling Mitaban Dip. It should not be given to pets taking another MAOI such as Anipryl, Selegiline or using a Preventic Tick Collar. Consult your veterinarian about other possible precautions you should take while using Mitaban Dip on your dog.